TOKYO, June 18, 2012—Canon Inc., Canon Marketing Japan Inc., and Canon IT Solutions Inc. announced today the introduction in Japan of the MR (Mixed Reality) System, a product design tool that merges the real and virtual worlds to contribute to reduced development times during the product design process. The new system will be available in late July of this year. As product lifecycles grow progressively shorter, it has become increasingly necessary for the manufacturing industry to introduce products to the market in a timely manner. The new Canon MR System makes possible the viewing of full-scale three-dimensional CG (computer generated) images that instantly react to changes in a user’s direction or movements, supporting the design process by allowing users to evaluate a product’s design and operability. During the design phase, the system can help reduce the number of prototypes required and, in addition to shortening the amount of time spent on development, can contribute to minimizing costs and environmental impact. Pricing will vary depending on system configurations in accordance with usage requirements. Canon’s MR System can be used not only during the design process, but also in a wide variety of applications. For example, the system can produce simulations enabling users to ascertain the optimal layout of production equipment at a manufacturing site before installation, making possible the review of work efficiency and safety by allowing users to walk through the plant and see potential equipment layouts firsthand. The system can also support sales activities by simulating actual products for customers, enabling them to handle and view the products from different angles, ensuring specifications satisfy all customer needs. Other possible applications include assessing interior layouts when renovating a home. Canon aims to expand applications for the new system into a wide range of fields in the future, such as surgical procedure simulations. Sales activities for the new Canon MR System will initially focus on the industrial design and other design fields—areas that are progressively making use of three-dimensional data. Canon IT Solutions, a key company in the Canon Marketing Japan Group, will lead sales for the new system in the Japanese market. The company will offer customized systems based on customer needs, drawing from its rich experience cultivated in the area of solutions utilizing 3D-CAD. Canon marketing companies outside of Japan will consider future sales activities in their respective markets. Canon will be displaying the MR System at the company’s booth during the 20th 3D & Virtual Reality Expo (IVR), one of largest 3-D technology and imaging technology exhibitions in Asia, from June 20 to 22, 2012, at the Tokyo International Exhibition Center. Recently utilized in gaming, advertising and other applications, AR (augmented reality), one type of MR technology, superimposes CG images onto the real world. By contrast, Canon’s MR System allows users to experience full-scale CG images from any point of view. Furthermore, by seamlessly combining CG images with real-world environments, the system creates the illusion that the CG visuals actually exist within the real world. 1. 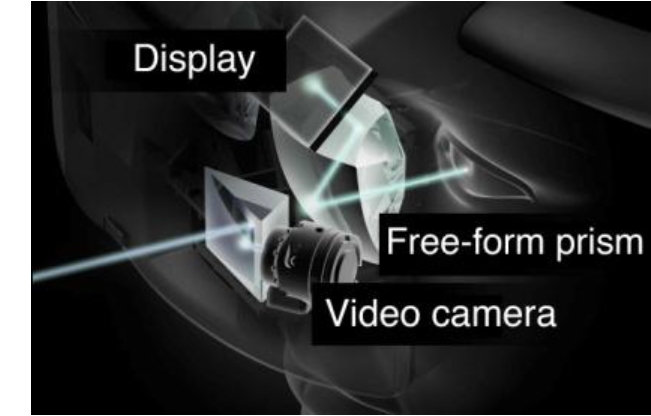 Two video cameras inside the head-mounted display (HMD), one each located in front of the left and right eyes, capture video from the real world, which is then sent to a computer. 2. Through image processing and positioning and directional sensor data, or alignment technology that combines both types of information, the CG visuals in the computer and the real-world environment are combined with high precision and displayed on the small monitors located inside of the HMD. 3. An optical system, comprising cutting-edge technologies, enlarges the video displayed on the small monitors to create high-impact three-dimensional images. • Even though the images are delivered through a video feed, by matching the video cameras’ optical axes with those of the light entering the eyes from the small displays, the system delivers a realistic experience, creating the impression that visuals are being seen with the naked eye. • Employing a free-form prism featuring a unique three-sided configuration, the MR System produces beautiful images with low distortion in peripheral areas caused by optical aberrations. 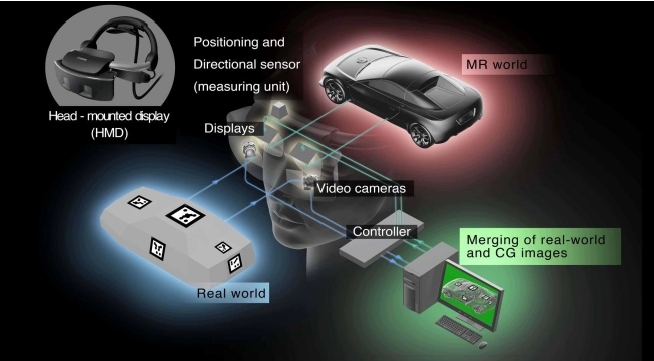 • Canon specially developed registration markers for the MR System that, through image processing, enable proper CG positioning within real-world environments. Based on the markers captured by the HMD’s video cameras, the system is capable of gauging the HMD’s position and orientation in real time. The displayed CG visuals are aligned with the HMD’s position and orientation, which is estimated one frame at a time, making possible integrated video that instantaneously reacts to changes in a user’s position or movement. • The MR System also supports optical- and magnetic-type sensors based on usage needs.